Come out for a fun afternoon of live music, kids activities, raffles, and tasty samples from neighborhood restaurants in The Triangle! Enjoy Live Music by Jon Lewis and Topher Holt! Bring the whole family! Topher will lead a Drum Circle for the Kids to play together in a band! Check out the Child Care Council Kids Zone with fun activities for kids of all ages. A Huge thank you to NeighborWorks Rochester whom is supporting this event as part of our final year in the Healthy Blocks program. The event is outdoors, free and open to the public! Welcome from the new co-chairs, Neighborhood Clean Sweep, and Expanding Pace Bike Share! Welcome from Mikey & Tyler! Hello Hello Hello! We are your new Triangle co-chairs! In March we began the Triangle Leadership transition over from Neighborworks Rochester. This transition will continue until the end of 2018. As many of you know, The Triangle formed in 2014 as a focus for Neighborworks Rochester Healthy Blocks program. This year is the final year of that program. We would like to give a big shout out to Monica Finger, the former Neighborworks Healthy Blocks coordinator who is now pursuing her masters degree! She was tremendous in helping us organize and coordinate many initiatives over the last few years! This Saturday (May 5th) from 8am-12noon is the city-wide Clean Sweep! Want to join in and directly help the Triangle? Volunteers can meet at the corner of Culver and Garson by the “Dollar General” sign/flower box. Tyler will be there with t-shirts and tools available to pick-up! P.S. When Mikey drives a Smart Car and has to buy 6 bags of mulch and a box of flower bulbs, it’s a “make it work” moment! A few neighbors have inquired about getting Pace Bike Share docking stations in The Triangle. We connected with Pace and (fingers-crossed) we will be part of the next expansion to the system. Stay tuned for more details on this! In the mean time, celebrate National Bike Month with a free ride for all 31 days in May! 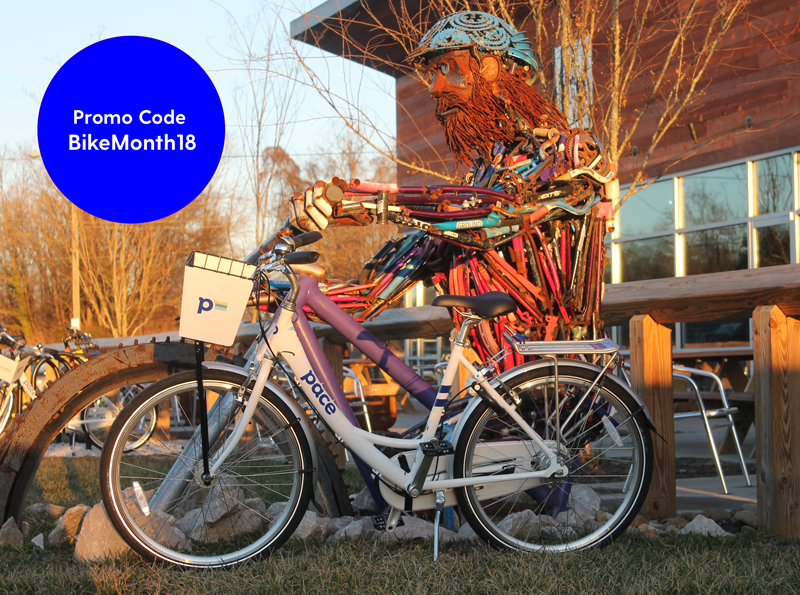 Now through May 7, enter the promo code "BikeMonth18" in the Pace app to unlock your free rides. Need a reminder? 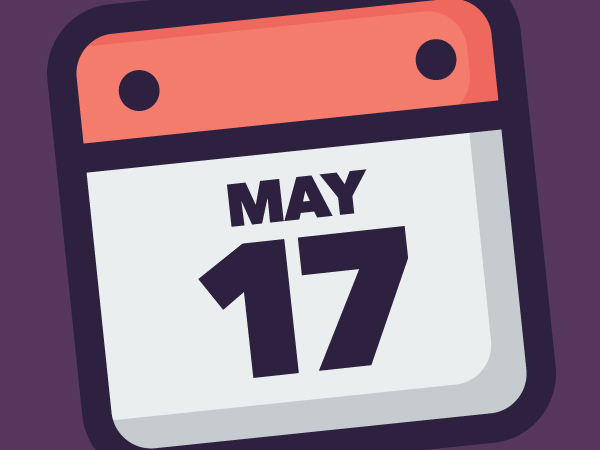 We recently created this recurring Facebook Event with the remaining 2018 meeting dates. RSVP on there to get updates and reminders! Ideas needed for the City's 2034 Comprehensive Plan! At our March 15th monthly meeting we will be joining forces with The Pocket Neighborhood to give input about projects and initiatives we would like to include with the City of Rochester’s 2034 Comprehensive Plan. City Planners from the City of Rochester's office will be joining us as well to explain the importance of the comprehensive plan and help guide our discussion. As a neighborhood, we can use this opportunity to outline projects and initiatives we would like to achieve by 2034. Whether you can make it to the meeting or not, we encourage everyone to take the time to complete the online survey here: https://rochester2034survey.metroquest.com/. You can read more about the Comprehensive Plan at the City of Rochester's website: http://www.cityofrochester.gov/comprehensiveplan/. We hope to see you you at this meeting on March 15th at 6:30pm at Johnny's (1382 Culver Rd.). Feel free to RSVP on our Facebook event at: https://www.facebook.com/events/152677415411793/. 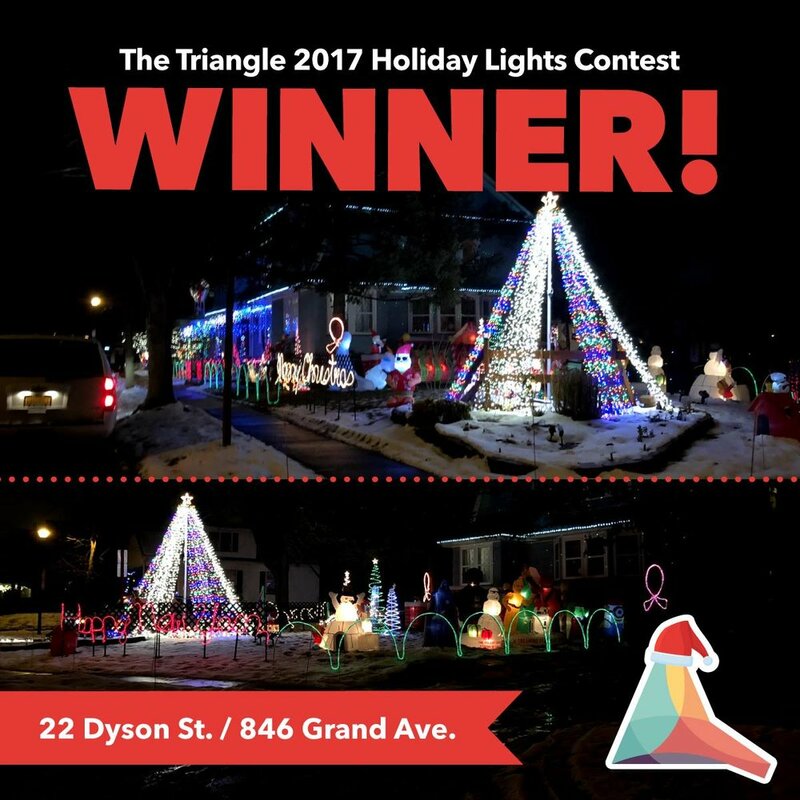 If you follow the Triangle neighborhood on social media (@triangleofNWV on Twitter, Facebook, and Instagram), you have likely been keeping up on the coverage of the second annual Holiday Lights Contest, thanks to the design skills of the Triangle’s media wizard, Mikey. The prizes for this year’s winner and runners-up surpassed last year’s haul, with 13 local businesses donating over $400 in gift cards and merchandise! Giving out presents around Christmastime is enjoyable no matter what the reason, but the Holiday Lights Contest is special way to thank neighborhood residents for reinvesting their time and energy (and let’s face it—their RG&E bill!) into keeping the Triangle bright and beautiful in the darkest and coldest season. So, to our winner and runner-up at 22 Dyson/846 Grand and 212 Akron—and the four honorable mentions—another BIG thank you! Of course, illuminating the winter streetscape is not the only reason to hold a Holiday Lights Contest. It has proven a fantastic method of connecting neighbors to one another, from engaging via social media to piling in a van and judging each decorated house in the Triangle to delivering the prizes to unsuspecting winners and hearing their stories—like how this year’s winner started putting up decorations in September and spent over 60 hours crafting his display. The winners with Mikey and Yvonne from the Triangle group. · Cobblestone: What should go there? How can we make it happen? · Culver/Garson Plaza: A mural on the kiosk? What else? · But more importantly: What do YOU want to see? Joining the Triangle neighborhood group for one of our monthly meetings (every third Thursday at Johnny’s Pub) is the best way to be on the forefront of what’s happening. The next one is January 18th at 6:30. See you there, and Happy New Year! New projects on Culver Road – Just in time for winter! Where: on the back of the building which houses Johnny’s Pub (next to the Rick Muto mural), 1378 Culver Road. The mural’s original proposed location was on the Culver-facing wall of the old Family Dollar (now Dollar General) plaza, but had to be moved due to insurance requirements imposed by the building’s owners and public safety concerns regarding the construction of the exterior wall. What: a community project initiated at the 2016 Community Leadership Institute (CLI), which is a convening of resident volunteers and non-profit staff held by NeighborWorks® America each year. Triangle neighbors have attended in 2014, 2015, and 2016. The CLI focuses on peer sharing, education, and best practices for resident leadership development. Who: the mural was designed by Shawn Dunwoody after a public visioning forum held at St. Mark’s and St. John’s Episcopal Church in July. The design went through a number of iterations before its final version was approved by the Triangle neighborhood group. When: the mural was painted by Shawn and community volunteers on November 25 and 26, and installed on Tuesday, November 28. How: funding for the project came from the CLI Action Plan Grant and from other resources cultivated by NeighborWorks® Rochester’s Healthy Blocks Initiative. Photo: Monica Finger. Excuse the orange fence! Where: outside the historic cobblestone house at 1090 Culver Road – the last remaining cobblestone house in the City of Rochester. What: a project that also came from the CLI, this time from 2015! ‘Microparks’ and ‘parklets’ outside businesses and in the public sphere make the street more beautiful and inviting for pedestrians and cyclists. Who: McCord Landscape Architecture provided landscape design services, Scott Construction of Rochester tore out the asphalt and graded the site, and Broccolo Tree & Lawn Care installed the hardscape and did all planting. 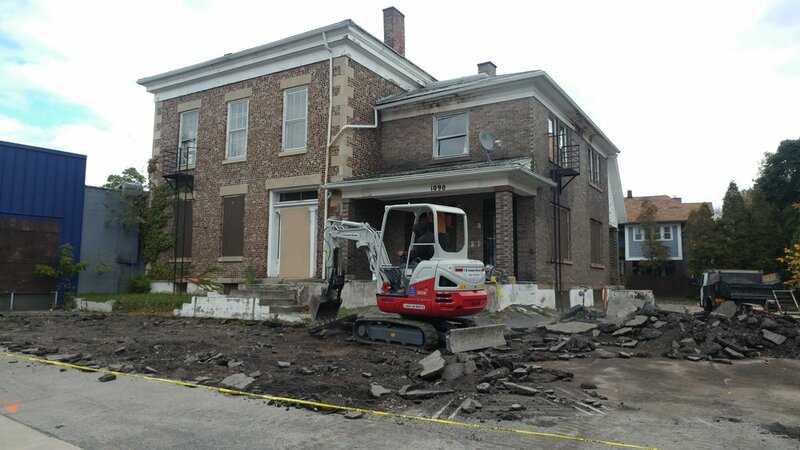 The Landmark Society of Western New York has been working with the property owner, the City of Rochester, and NeighborWorks® Rochester to move the house itself towards rehabilitation. When: the parklet was completed on December 1. However, it will be getting a touch-up in the spring when the plants come back up, so keep an eye out for a celebratory event to be held next year! How: besides the grant provided by the CLI, additional funding for the micropark was given by Frontier Communications and by NeighborWorks® America’s Pride in Place opportunity. Where: four painted ‘gateway’ structures will stand prominently on the corners of Culver Road and East Main Street, serving as welcome signage to the four neighborhoods that meet at this intersection (Beechwood, the Triangle, North Winton Village, and ACE). As of writing this, one has currently been installed (on the North Winton/Southeast corner) and the other three are nearing completion. What: the gateway signs began as an idea from the (you guessed it!) 2014 CLI. Although it has taken many years to realize the concept, the purpose remains the same: to celebrate both the unity and cooperation between the four neighborhoods and their distinct uniqueness. Who: local muralist Thievin’ Stephen worked with students at East High School and other neighborhood leaders to develop a portfolio of notable architecture from each of the four neighborhoods. Using those images, he created collages and painted them onto wooden gateway structures using a stencil/spray paint method. 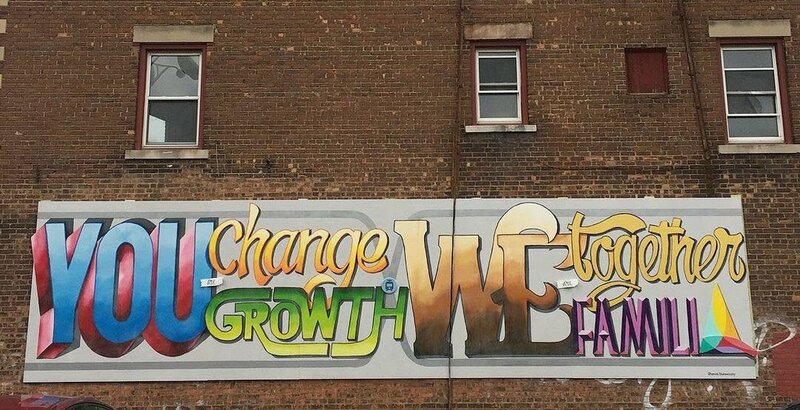 Thievin’ Stephen’s work can be seen all over the City of Rochester (check out his Instagram for more). When: the first gateway was installed on December 7. Weather permitting, the other three will be installed by the end of 2017. How: the City of Rochester contributed the bulk of the funding for the gateway project. Thank you! If you’ve spent much time in the Triangle neighborhood, you’ll know that one of its major sources of pride is the last standing cobblestone house in the City of Rochester, located at Culver Road and Grand Avenue. The house, built in the mid-1800s, suffers from both a mid-19th century addition on the south side (somewhat unattractive) and a large plaza built adjacent on the north side (very unattractive). Nonetheless, although it has been vacant for over a decade, the structural integrity of the cobblestone walls has remained, and so has the neighborhood’s interest in the property’s revitalization. The scoop: the owner is now in conversation with the Landmark Society (who included the property on their 2015 “Five to Revive” list) and a potential developer to rehabilitate and reoccupy the building, perhaps into a mixed-use or commercial gathering space (when last occupied, it was a four-family residential). A photograph of the house from the 1800s, when it was still surrounded by farmland. Exciting as these developments are, it is no excuse to ignore the property—and its large, paved lot—in the meantime! 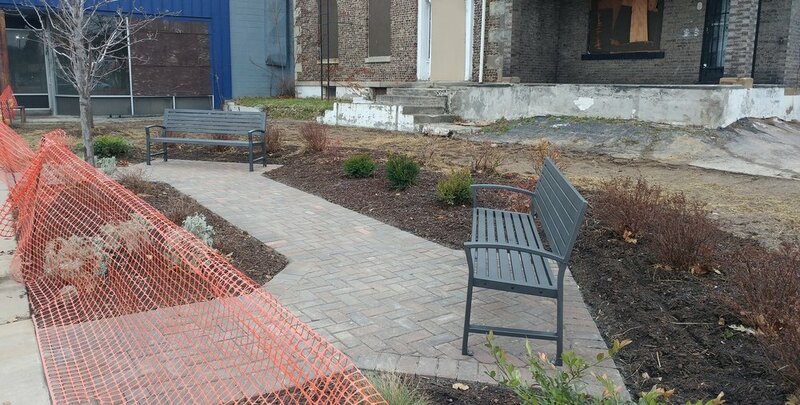 With support and funding from the Healthy Blocks initiative at NeighborWorks® Rochester, ground was recently broken on the Culver-facing side of the cobblestone for a new public micropark. The space—which will feature a seating area, trees, and low-maintenance perennials and shrubs in addition to a large grassy area—will serve both as a face-lift on the Culver Road streetscape and a resting and gathering place that improves the overall walkability of this gateway artery through the Triangle and Beechwood neighborhoods. Asphalt removal began on October 25. House and park aside, what better way to gather the neighborhood around the property in a positive way than a holiday where families are already outside en masse regardless of weather—Halloween, of course! The first annual Cobbleween, originally invented as a playful not to the “zombie” condition of the house, happened October 31st 2017 from 6-8 PM and was a huge success. Cobbleween, planned and executed by the Triangle neighborhood group with support from Healthy Blocks, featured music, decorations, pumpkin painting, face painting, free donuts, cider, and coffee, the Rochester Mounted Police, outside games, a costume photo booth, giveaways, and tons of candy! Businesses and organizations from within and outside the Triangle pitched in to make in-kind donations, including Lowe’s, Mayer Cider Mill, St. Mark’s and St. John’s Episcopal Church, Donuts DeLite, Elite House of Hair Fashions, New City Café, NeighborWorks® Rochester, the Landmark Society, Broccolo Tree & Lawn, Merchants Grill, and the Healthi Kids Coalition. Triangle resident Julie--I mean, Pikachu--helps kids paint pumpkins. Cobbleween proved to be a huge hit! Donuts, cider, coffee, and pumpkins ran out long before the stream of visitors, and the neighborhood estimates that over 150 people attended, mostly families with young children on the trick-or-treat. The Triangle plans to make Cobbleween an annual event—neighborhood volunteers were scheming how to make 2018 bigger and better before the night was even over! Would you like to be involved in this and other fun and meaningful Triangle neighborhood projects and events? The leadership group meets every third Thursday of the month at 6:30 at Johnny’s Pub. Please join—all are welcome! Spooky treats courtesy of Donuts DeLite, members of the Triangle Merchants Association. The process of obtaining a good tenant for a vacant commercial space can be lengthy and difficult, especially if ownership of the building in question changes hands in the process. As a result, empty windows and lifeless storefronts can linger in an otherwise vibrant area, reducing foot traffic and giving the street an underdeveloped appearance. The solution: vacant space can be used creatively, on a short-term or one-time basis. The outside of the currently vacant building. When the building at the "Point" of Culver and Merchants Roads was bought, the new owner was quick to make contact with the Triangle Merchants Association to explore how to approach the valuably located space to make the maximum positive impact on the Triangle. Residents of the Triangle neighborhood, Healthy Blocks staff, and volunteers from the ImageOut Film Festival and Gallery Q joined forces to host a one-night First Friday gallery event in the space. The event served dual purposes—to draw attention to the neighborhood as a place that celebrates the arts and LGBTQ communities and to help the community (and perhaps even potential tenants) to envision how beautiful and visually interesting the property could become with a small amount of TLC. A view into Katie Efstathiou's exhibit from the sidewalk. Indeed, the "Point" was transformed for those few hours. Posters advertising the event were prominently displayed in the windows, and passersby could peek into the illuminated ‘gallery’ rooms and see photography and animation by artists Chen Wang, Katie Efstathiou, and Citlati Fabián projected on the walls. Oil paintings and multimedia creations from residents Julie Boswell and Zirrus VanDevere lined the walls of the foyer area, where folks gathered around food and music. In the hall, a photographic installation by Tina Star captured the guest’s attention in the space between galleries. Attendees commented on the suitability of the space for this type of event—but in reality, a number of community-focused, creative events could have served the same purpose. The presence of other humans is what allows a space to come to life, and the event saw around 40-50 people pass through. Guests enjoy a painting by Julie Boswell, with photography by Tina Star opposite. Attendees gather in the main lobby, enjoying food, music and art. Photographer Citlati Fabián shows guests her portfolio. It is worth noting that the City Newspaper and the Democrat & Chronicle both ran short articles to promote the event, which can be read here and here. Are you interested in opening a business in all or part of this great space? Call (585) 237-860 or send a note to info@optimistcp.com and be a part of the continued revitalization of the Triangle. Since 2014, NeighborWorks® Rochester’s Healthy Blocks Initiative has been active in The Triangle neighborhood of North Winton Village, working to improve property conditions, neighborhood image, and resident engagement. Part of the work of Healthy Blocks has been focused on making the neighborhood greener through various projects: tree plantings, clean sweeps, free home energy assessments through Green Jobs/Green New York, connecting residents with loans and grants for energy improvements through New York State’s EMPOWER and Assisted Home Performance programs, and more! NeighborWorks® Rochester collaborated with the Rochester Area Community Foundation, NeighborWorks® America, and GRID Alternatives to fund and implement five free rooftop solar installations to low-to-moderate-income families in the City of Rochester. This pilot program, the first of its kind in Rochester, also included workforce development portion, where students in community college solar programs participated in the installation of the panels and earn a certificate that indicates real job experience to potential employers. Using this model, the first two installations were completed on City homes in November of 2015. GRID Alternatives completed the remaining two low-mod solar installations in early 2017.